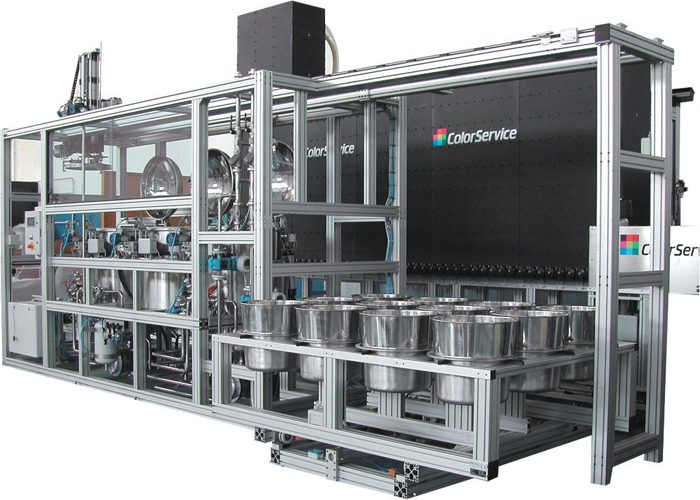 Color Service was the first company to produce this innovative and reliable system. Our weighing unit mod. 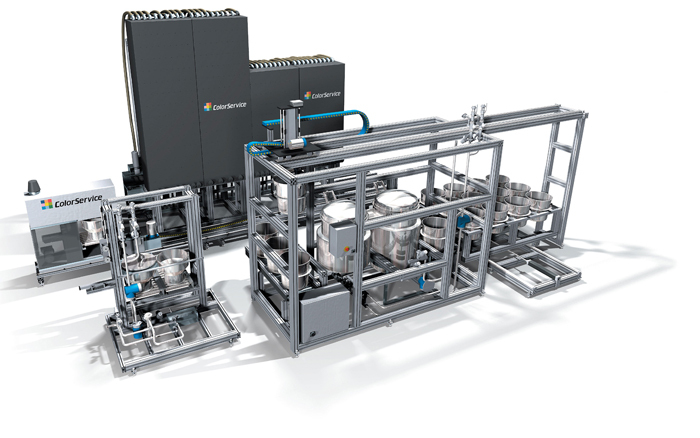 TRS automatically weighs any type of dyestuff in powder or in granule form, guaranteeing accuracy of the dosing, reproducibility of the recipes and the maximum hygiene in the working environment. The machine structure is very strong and durable as the boxes are made in anodised aluminium, from 90 lt. to 450 lt. capacity. The system is both modular and expandible. 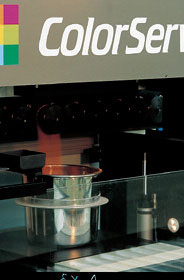 The dyestuff transfer is made through suction with high head and low delivery. This characteristic offers rapid loading performance and it has a low air consumption with low filtering surface. Moreover the lower contact between air and dyestuff guarantees the original level of moisture content. Automatically a counter flow air circuit cleans the filter. The hoppers are equipped with high speed irrigation screws on which it is mounted a scraper patented by us. This combination allows a remarkable accuracy within small weighings and the accuracy is guaranteed by the use of Mettler’s high accuracy weighing instruments. 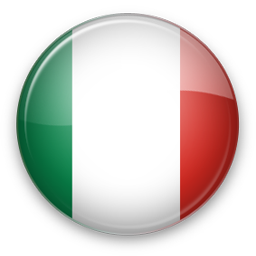 This system has been applied to many sectors, such as textile, printing, ceramic, wood, cosmetic, varnishes, making the suitable personalization required by every market. In order to satisfy the demand of big capacity dyeing machines or to serve a substantial number of machines, it is possible to install a parking for weighed recipes, combined with the TRS weighing unit. In this way the recipes having a considerable amount of dyestuff (i.e. 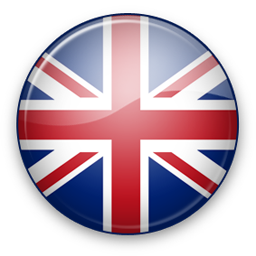 40 or 50 kg) can be weighed in advance by the TRS, stored in the parking and dissolved immediately upon request of the dyeing apparatus. The robot of the dissolver handles the automatic motion of the kegs, carrying them from the parking to the dissolution tank. - SCC 35 lt. with 1 dissolution keg to dissolve medium quantity recipes, of about max 15 kg. 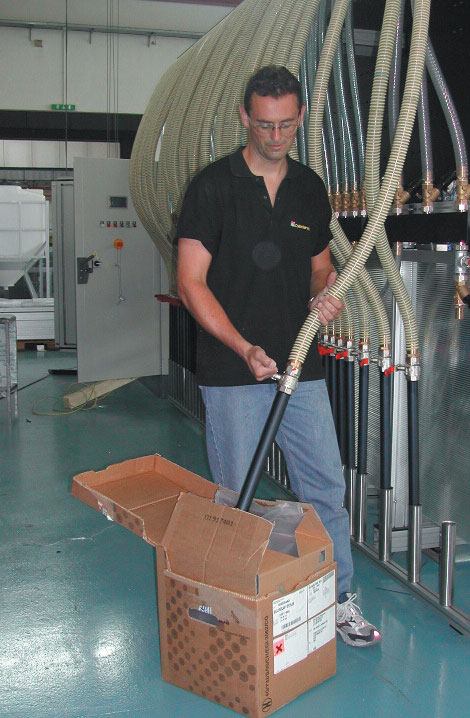 - SCC 50 lt. with 1 dissolution keg to dissolve medium quantity recipes, of about max 18 kg. 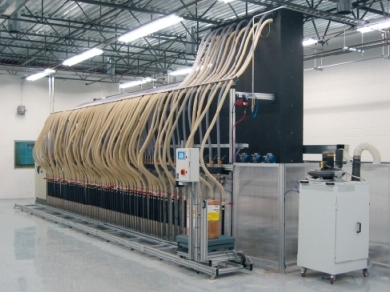 - SCC 2 with n.2 dissolution tanks to serve big capacity machines or a substantial number of dyeing machines. The dissolution units will then send in automatic the dissolved dye,according with the parameters of dissolution fixes by customer, at destination. 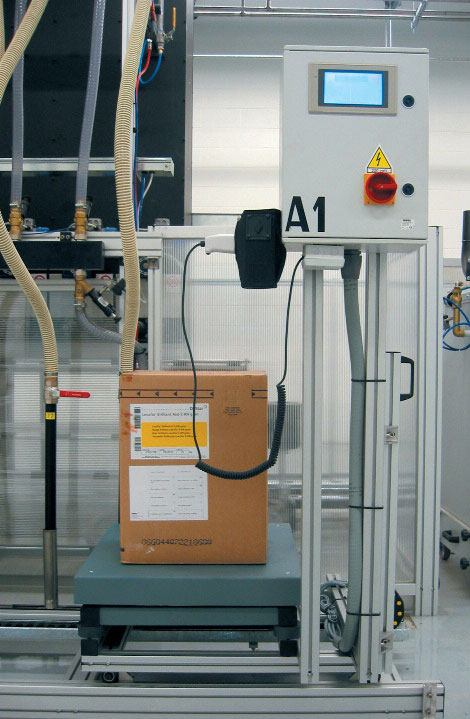 In alternative to the solution in full automatic, the weighing unit TRS can weigh the recipes into buckets or into hydrosoluble bags, depositing them on a rollerway. Every recipe will have its own ticket printed. With this very easy operation, the operator keys on the touch screen the position of the dyestuff to be loaded. The pump starts automatically, the manual valve is opened and the transfer starts. Optional is the barcode reader. The dyestuff scale trolley is completely closed and a slight vacuum is created during the weighing phase. This prevents atmospheric pollution and it protects the scale from air currents. 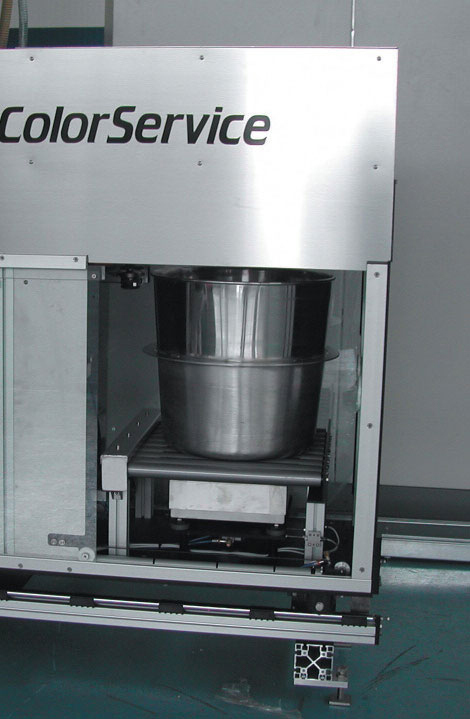 Together with other technology employed only by Color Service, you are guaranteed with accurate and reliable weighings. To avoid any possibility of mistake, the operator can place the box on the scale and thanks to the barcode, the touch screen automatically recognize the dyestuff type and in which position it has to be loaded. At the end of the loading the software will automatically update the loaded quantity.The scale trolley can be completely closed, to handle the dyestuff used in the cosmetic industry.